My shopping ban has been in place for six months, so I thought I’d use this post you update you on how it’s going. I have to admit that I did find the first few weeks difficult. I had urges to go shopping for groceries, even when we had ample supplies. However, I managed to overcome these by remembering why I had put the ban in place – to save money and to help the environment. By using everything we have before buying more, we have less waste to dispose of. Only buying items we know we will use has helped immensely, too; no more rotting food items lurking at the bottom of the fridge. With spring approaching, recently I have had an inclination to go to the shops to buy some new t-shirts. So far, I’ve resisted the urge, again by remembering my reasons for the shopping ban. I did have to buy a new pair of shoes for a funeral a few weeks ago; something I should have considered when having my clearout. But all the shoes I got rid off were made of leather, and I don't feel comfortable wearing leather anymore. I bought a pair of black Van's; not standard funeral attire, but they are something I can wear again and again. I’ve saved a substantial amount of cash, too. But the thing I am most happy about is how much more time I have to do the things I like, and I’ve surprised myself with how much work I've completed, too. Since putting the shopping ban in place, I’ve finished numerous drawings, I've posted on this blog regularly, I've frequently been posting on Instagram, and I’ve started a couple of new writing projects as well. Up to now, the shopping ban has worked well. I’m determined to continue on this track, and I'm enjoying the thrill of not spending money on stuff I don't need. I’m posting a bit later than usual today. I had a couple of appointments this morning which held me back, but better late than really late. As a result, I’m going to keep it short. I’ve been drawing steadily. 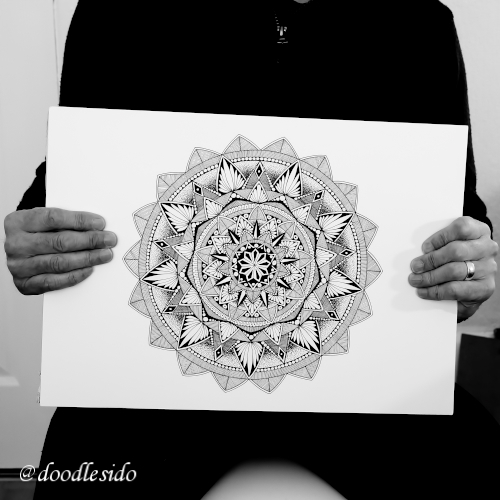 My new glasses have really helped – no more headaches – and I’m thoroughly enjoying designing my mandalas. The challenge for me is trying to come up with different patterns, but I feel my method of working makes this easier than it might be. After I draw my grid, I don’t do any further pencil sketching. I go straight in with the ink, and let my mind take the pen where it wants to go. This might not suit everyone, but it works for me. Hope you like this week’s drawing. Oh, by the way, this is as close as I’m ever likely to get to a ‘selfie.’ I hate being in front of the lens. According to a recent report, automation will claim 800 million jobs by 2030. Machine operators and food workers will take the hardest hit, and it’s estimated that one-fifth of the global workforce will be affected. In the United States, between 39 and 73 million jobs will be eliminated, while in the UK 20% of current jobs will become automated. On the bright side, the report also indicates that new technology will see new types of jobs emerge. Also, jobs such as gardening, plumbing and care work will be less affected by automation. I’ve started to notice that when I’m out shopping, fewer people are manning the checkouts. In one store, I could not find a single checkout being attended. Instead, the staff were eagerly pointing shoppers in the direction of the ‘self-service’ checkout. At my local bank, I see a similar scenario. On entering, I am greeted by a member of staff who asks me what I need to do. If I want to lodge cash or a cheque or make a withdrawal, they point to one of the many ATM’s. It feels like they are reluctant to let me approach the counter. Call me old fashioned if you like, but I want to communicate with a person when I’m being served in a shop or at a bank. There are times when the ATM does come in handy, but it’s nice to talk to a human being. Older members of society that I have spoken to do not like this new approach. They don’t trust the machines, they find them complicated to use, and there are some who don't even own a bank card. In addition, for many older folk, a trip to the shop is the highlight of their day. Lots of older people live alone, and a two-minute chat at the checkout may be their only interaction with another human being for twenty-four hours. Of course, the banks and the shops will tell us that the introduction of these machines is to make things more convenient for us consumers. But is it? I think not. More machines mean that shops and banks require less staff - less staff means fewer wages to pay - fewer wages to pay means bigger profits for retailers and banks. Don’t get me wrong; technology is good. Technology has done much for humankind. At the flick of a switch we can heat our homes, talk to friends in faraway places and advancement in medical technology means we can cure diseases that only a short time ago were considered fatal. Technology has its place, but I think it’s time we asked ourselves who all this technology is serving? Us, the consumers, or the global giants of retail and banking? I received a call from my mobile phone provider yesterday. "Great news!" the voice said. "You're due a phone upgrade." I asked her why any of the phones she told me about would be better than the one I currently own. "Oh," I said, "I don't use the camera phone, and I get two days from one charge on the phone I have. So I don't need a better camera or a longer lasting battery." She told me that the longer living battery would enable me to keep up to date with social media and the like when I was out and about. When I told her I didn’t use social media when I went out, she seemed bemused. When I go out, I go out to enjoy the beach or the countryside. I don’t need, or yearn, to keep up with everything that is going on. I do that when I’m at home. However, she then went on to tell me about great new deals they had for call, text and data packages; all of which were more expensive than my current plan. I quickly told her that I didn’t use all the data, call time or text messages I currently pay for. So, why would I need any more? I told her again that I did not use the internet when I was out. I actually go out to get away from all that stuff. I like to take time to enjoy the sights and sounds, and I can do that better when I don’t have my face glued to a screen. Again, she appeared a little lost. I explained that I was happy with the phone I had and I would continue to use it until it stopped working and that I really didn’t need any more call time, data or text messages. “Oh, Okay. So we’ll keep you on your current tariff, but without the additional cost of a new handset,” she said. I told her that would be fine and that when my phone stopped working, I would call them; the network provider. “Okay, have a nice day,” she ended the call with a twinge of disappointment. Every day somebody is trying to sell us stuff we don’t need. They try to ‘reel us in’ by telling us how or why we need their product, even when we have told them we don’t require or desire whatever it is they are try to sell. The phone I have, which I have now paid for, is two years old. It is still working perfectly. I don’t need a new one. I don’t want to buy a new phone just so I can shove my phone into a drawer where it will do nothing but gather dust. I will be saving money from not signing up to another contact, and when the time comes, I will be able to shop around for a new handset without getting into a financial agreement with my network provider. I do use the internet occasionally when I’m out, but my current plan gives me more than enough data to do that. I’ve had several similar phone calls recently. My broadband provider called to entice me into getting my television services re-installed. I declined their offer, too. When it comes to signing up for things I don’t need or want all of these people have discovered, despite their best efforts, that this fish ain’t biting anymore.